What is the A-100 series of cable glands? Conforming to the latest national and international technical standards, the CMP A-100 series of Explosive Atmosphere cable glands has been designed, tested and certified to withstand the rigorous “100% pull test”. What benefits does the design of the product provide to the user? 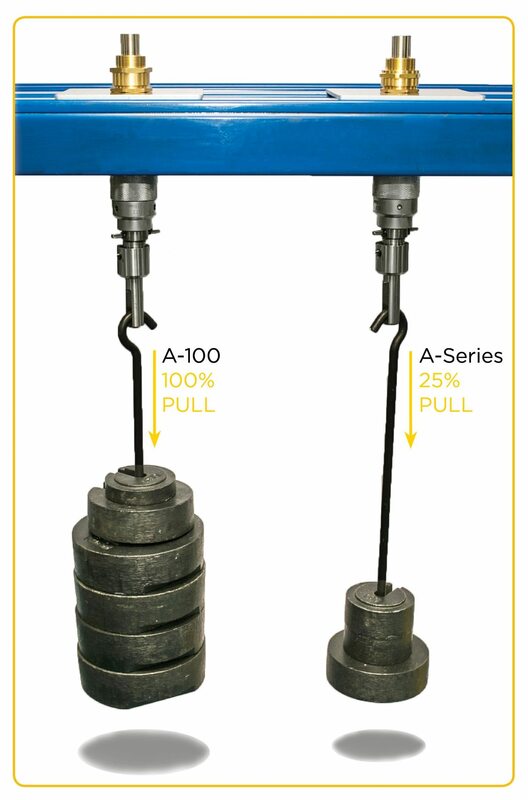 Due to its unique design, the A-100 series (A2F100, A2e100, RA2e100) removes the need for a cable clamp or cleat before the point of entry where the cable gland is installed; saving time and expense, whilst delivering products that are among the safest in the world. The displacement-type sealing rings used in the CMP A-100 series are designed for explosion protection and mechanical cable retention in compliance with IEC 60079 standards. These sealing rings exceed the requirements of Clause A3.1.1, Annex A, of IEC 60079-0:2011, which refers to the cable pull out resistance test of ‘clamping non-armoured and braided cables’. What cable types and locations can the A-100 series of cable glands be used in? The A-100 series is intended for use with all types of unarmoured and braided cables in Zone 1, Zone 2, Zone 21 and Zone 22 Explosive Atmospheres complying to the latest IEC 60079 standards. What testing has the product undergone to ensure its safety, quality and reliability? In order to comply with IEC 60079-0:2011 cable glands must be tested for thermal endurance and then be capable of holding a variable but substantial force which is determined by the external cable diameter. This thermal endurance test is designed to replicate the lifespan of the cable gland and sealing ring, and is intentionally harsh on the product’s material and characteristics. Through extensive research and development and due to the high grade of materials used at CMP, the A-100 series functions without fail even after thermal conditioning. Ultimately the IEC standard requires the cable gland to hold a polished steel mandrel (in place of a cable) , for a period of 6 hours, by use of the elastomeric sealing ring only, with a force in Newtons (N) applied equivalent to 20 times the cable diameter. For a 20mm Ø cable, a 400N force is applied, which equates to 40.76Kgs with a maximum slippage of 6mm allowed. This is extremely difficult to achieve for most cable glands of this type. What other additional benefits does the A-100 series provide to the end user? Ingress Protection – Offered by CMP Products in the A-100 series includes IEC 60529 specification tests IP66, IP67 & IP68 to a depth of 60 metres for a period of two weeks. Deluge Protected – The same products have undergone extensive deluge testing to DTS 01 : 91 which surpasses the conditions required by IEC 60529, with accelerated aging tests replicated by a thermal endurance programme applied before the deluge testing process. Temperature Range – A-100 series cable glands offer a temperature range of -60?C to +130?C. When you say eliminating special conditions, what does this mean? Where a product has not been tested to 100% load, or cannot meet the full test conditions of IEC 60079-0:2011, the standard permits a reduced load test equal to 25% of the declared values. In this case the product certification will contain a special condition, denoted by a suffix letter ‘X’ at the end of the certificate i.e. 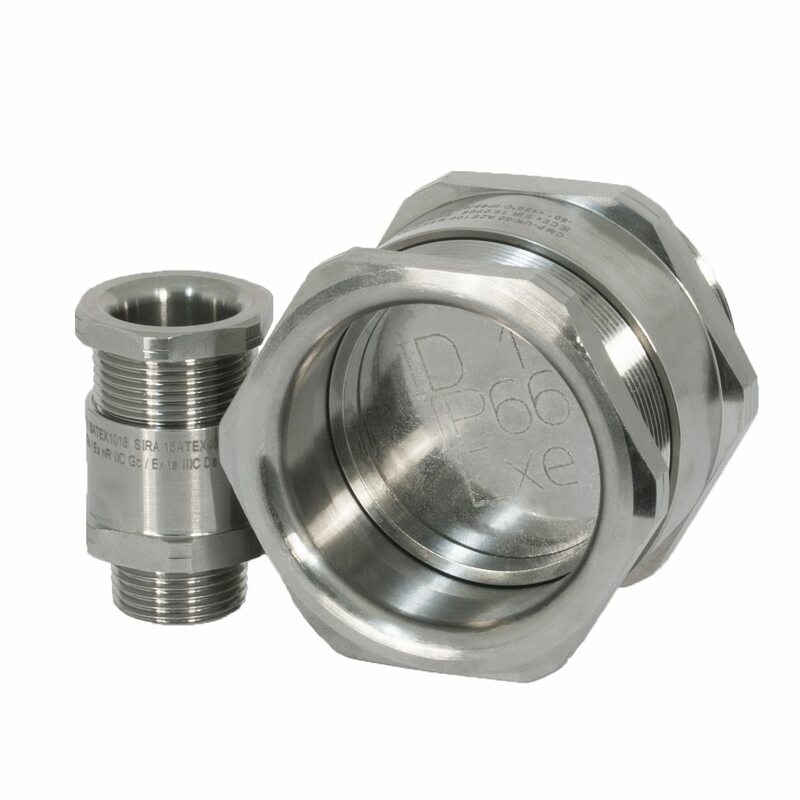 “Cable glands for use with unarmoured or braided cables are only suitable for fixed installations, the cable for which must be effectively clamped to prevent pulling and twisting”. When this condition exists there is a need, defined in various installation standards for explosive atmospheres, to secure the cable within a specified distance (preferably 300mm) from the end of the cable gland, for example clause 10.3 of IEC 60079-14:2013 This is to ensure that the results of any rotational movement or twisting, and pulling forces or tension are not transferred to the cable conductors and their terminations inside the enclosure. The CMP A-100 series eliminates the need for this additional clamping and surpasses the requirements of IEC 60079-0:2011 without the need for any special conditions. Image to right showing the CMP A-100 and a standard A series cable gland during cable pull out resistance tests.